Those interested in using the Micro Four Thirds system – namely Olympus and Panasonic Lumix – for astrophotography might harbour some concern about the performance of the smaller sensor in low-light conditions. In his series of dedicated blog posts, Canadian photographer and Olympus Trailblazer Peter Baumgarten alleviates many of these fears by showing you how to make the most out of the OM-D E-M1 for astrophotography. The first post is an introduction to astrophotography. Here he shares all the most essential tips to help you create a stunning image, from the basic exposure settings to compositional techniques. The second deals with Live Composite, a feature combines multiple shots into one full-resolution RAW and/or JPG file in-camera. Since the camera only adds new points of light to the composite, it is useful for capturing the trails created by stars as they move across the night sky. This feature is currently unique to Olympus cameras, and while Panasonic Lumix has a similar mode called Live Composition, it only produces an 8MP JPG. His latest post is all about photographing the full moon. It features tips on how to shoot the moon on its own or within a scene where the moon is the main subject by using the Multiple Exposure feature of the E-M1. We highly suggest checking out Peter’s blog as it is a wealth of helpful and well-written information. 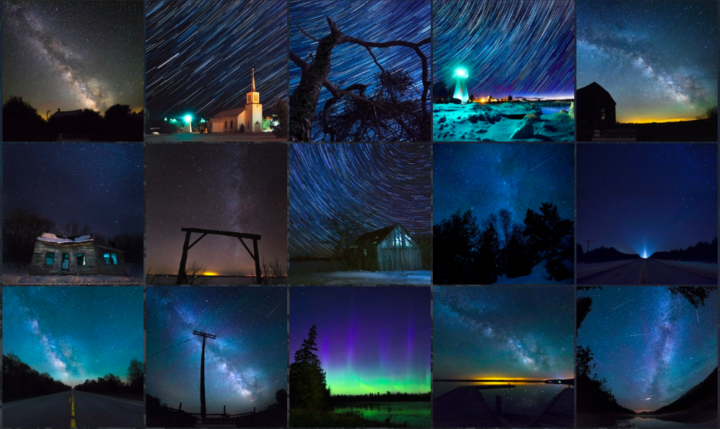 You can also check out his 500px gallery of astrophotography images here.